It’s never too early to start thinking about how you want to spend the holidays! Our frog squad looks forward to our tradition — celebrating Christmas at Universal Studios Hollywood at the beginning of the holiday season! Each year, we time our visit to occur on the opening weekend of Grinchmas so we can enjoy the Holiday Who-bilation and then hop over to the Wizarding World to experience the magic of the holiday season in Hogsmeade with shows, decorations and delicious foods — and there were so many fun new holiday foods to try throughout Universal Studios Hollywood last year! We can’t wait to see what 2019 brings. They have not released the 2019 specifics yet, but what we do know is that you’ll find all of Universal decorated for the holiday season, with colorful lights, bows, ornaments and even a dusting of snow. 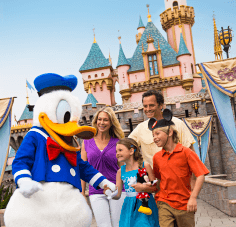 Your favorite characters don their Santa hats or ugly Christmas sweaters and scarves to greet guests. And behold the merry (and mischievous!) 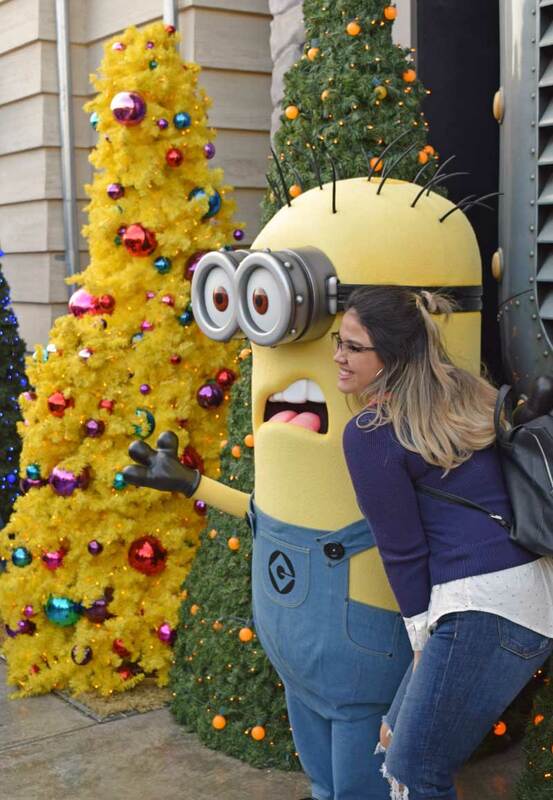 minions who also help you get into the holiday spirit. Hold onto your wizard hats and join us for the complete guide to Christmas at Universal Studios Hollywood 2019. In the Harry Potter books and movies, Harry wakes up on Christmas morning to gifts that magically appear at the foot of his bed. Hogsmeade is covered with snow and decorated with greens and enchanted candles. Harry experiences his first ever Christmas feast of roast turkey and mounds of side dishes and other goodies, and now, so can you. 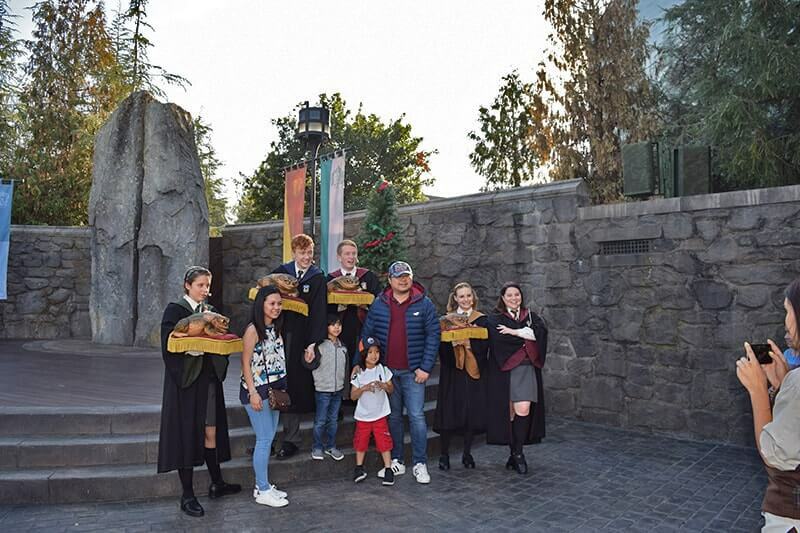 Here’s your chance to magically transport yourself to The Wizarding World of Harry Potter this season, so you’d better add Universal Studios Hollywood tickets to your wish list this year so you can experience all the Universal Studios Hollywood holiday events and magic, too. 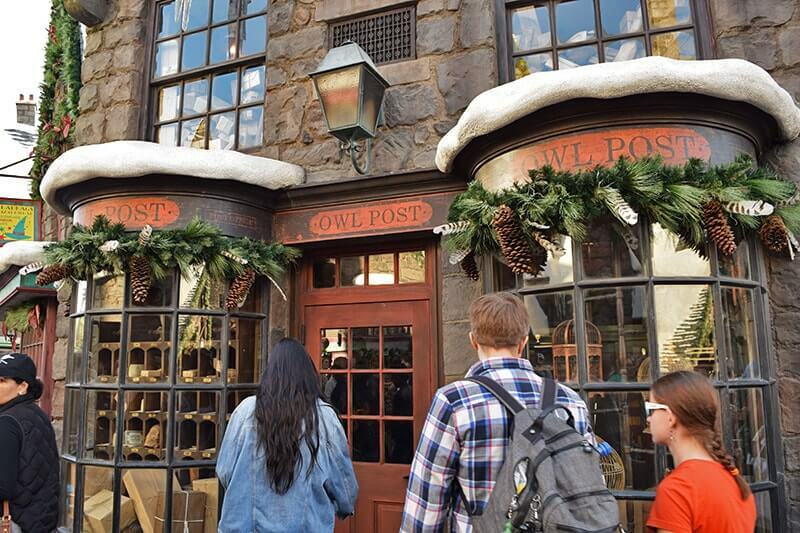 Dazzling holiday décor throughout the streets of Hogsmeade including lights, wreaths, garland and the largest ball of mistletoe you’ve ever seen. Holiday food — try hot Butterbeer, the way Harry Potter and his friends enjoy it. Seasonal foods in 2018 included the English Holliday Dinner with juicy turkey, sourdough stuffing, carrots, Brussels sprouts, bacon-wrapped sausage and cranberry sauce at the Three Broomsticks. It was quite tasty. They also offered a Cheese Toasty with Chicken sandwich (think fancy grilled cheese and a chicken salad). 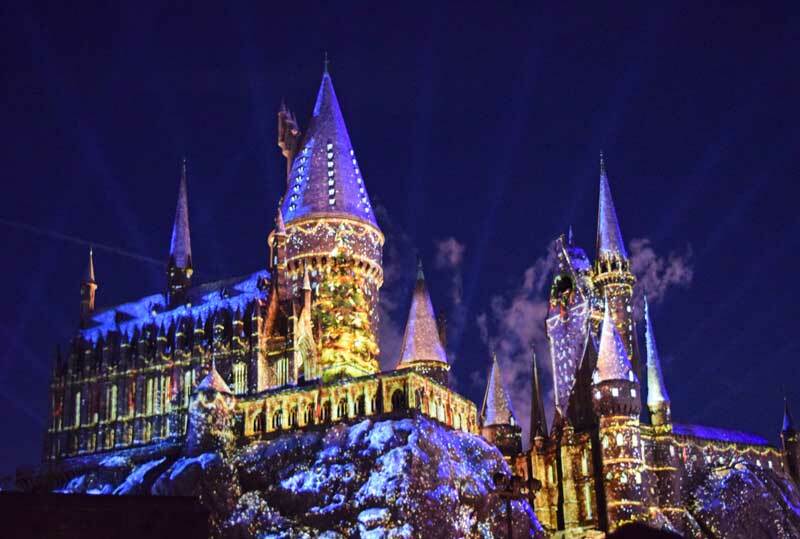 Nightly Snowfall — after The Magic of Christmas at Hogwarts Castle, wander through Hogsmeade village for snowfall. Listen for the bells to chime to signal the beginning of snowfall. It may fall before and after The Magic of Hogwarts Castle, so don’t rush in and out of Hogsmeade. 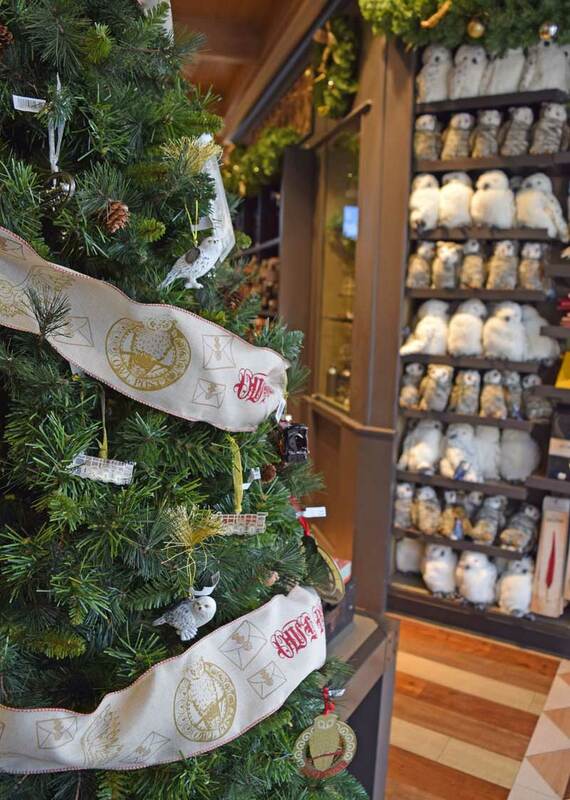 Holiday shopping — pick up your wizarding ornaments, stockings, figurines and tree topper so you can take the holiday magic home with you. Universal no longer prints out show times, so you’ll need to ask team members in wizard robes for show times. The Magic of Christmas at Hogwarts Castle show times don’t usually appear on the Universal Studios Hollywood app or www.ushwaittimes.com site, although you can find the Frog Choir and other show and music times (under music). When we visited, the castle show was expected to start at 6 p.m. and run every half an hour until park closing at 7 p.m., although there was a surprise early bonus show at 5:20 p.m. or 5:30 p.m. each night we visited. We recommend getting in place an hour before the first scheduled show because Hogsmeade reaches capacity during show time on peak days, and team members may stop letting guests enter. If it is crowded and dark enough, you might get treated to an early showing. Then, after the show, linger in Hogsmeade for snowfall. 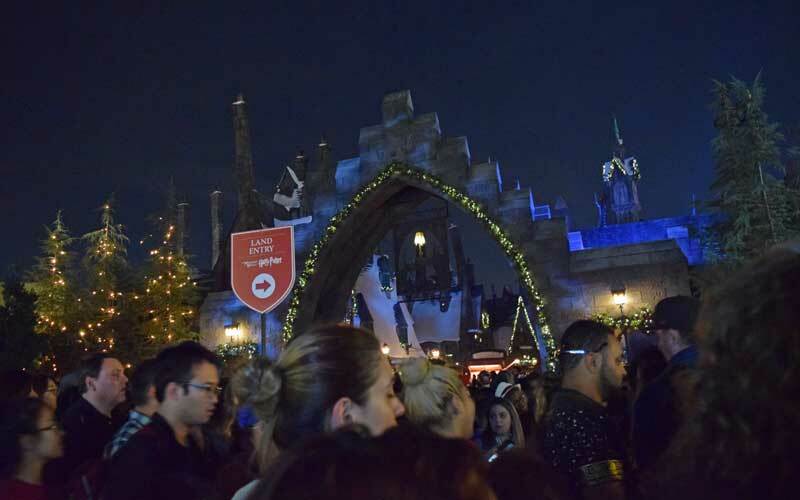 If you exit out the backside of Ollivanders after the Magic of Christmas at Hogwarts Castle Show (where employees will encourage you to exit), you will miss snowfall and may not be able to re-enter Hogsmeade due to crowds. When the park closes early during the week, there may be fewer shows than later weekend or holiday nights. Be sure to find out in advance, so you do not miss it. If it’s been a while since your last visit to the Wizarding World, be sure to try out some of the new spells with your interactive wand. The park may begin limiting entry into The Wizarding World to control crowds, and may only admit people as space allows, so be sure to plan around that. 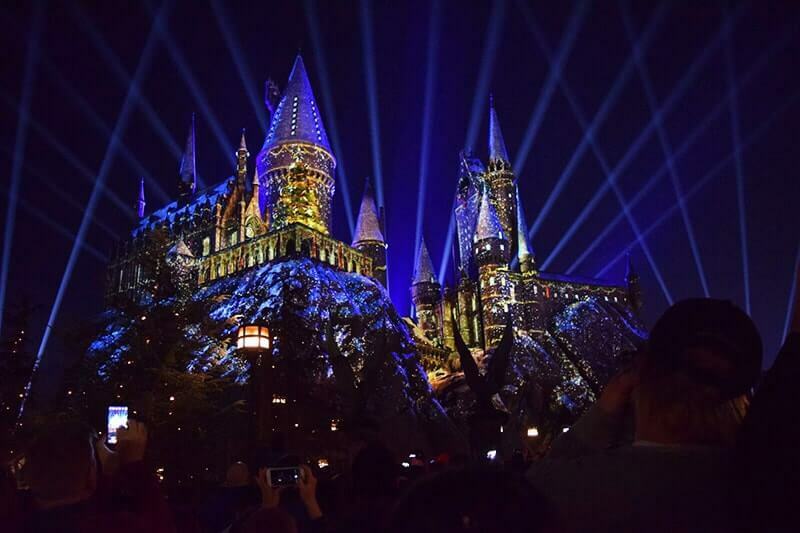 Having multiple shows allows you to see the Magic of Christmas at Hogwarts Castle show and also hop over to the Grinchmas tree lighting on nights with Grinchmas. Chances are you’ll want to experience Grinchmas during Christmas at Universal Studios Hollywood, too. Some of my hoppiest holiday memories involve reading and watching Dr. Seuss’s "How the Grinch Stole Christmas" as a young froglet. That’s why I am always just as excited as the kids to ring in the Wholiday season during Grinchmas. There is much to do during Grinchmas, so here is the Who (get it? 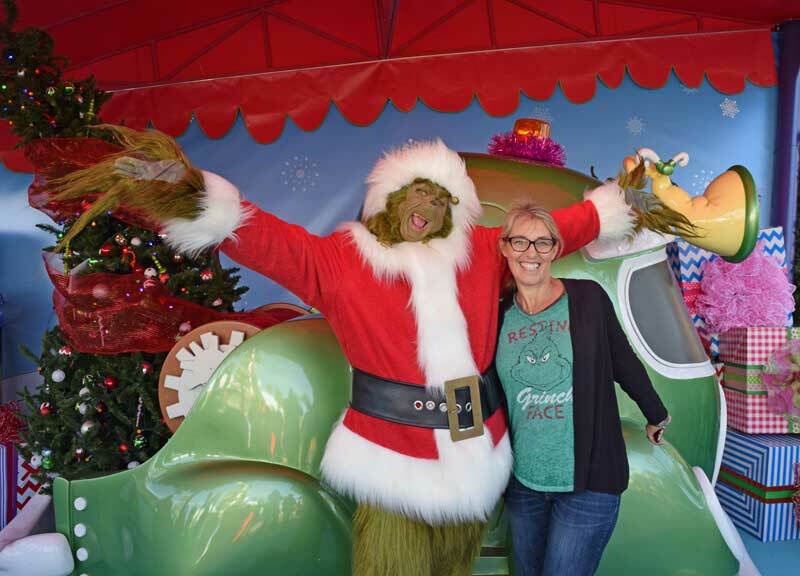 ), what, when, where, why and how of Grinchmas, all neatly packaged for you in our Grinchmas Universal Studios Hollywood 2019 holiday events guide. Many costumed Whos are just “whom” you will find waiting to greet and entertain you during Christmas at Universal Studios Hollywood 2019. Not to mention, the Grinch himself and even his dog, Max, will be present. Meet Cindy Lou Who and her many Who friends, from the tall (on stilts) to the small as they are walking around, posing for pictures and performing on stage (singing and dancing). The Grinch has become quite popular and chatty since his heart grew three sizes, so be sure to visit him and take a photo early — lines grow throughout the day. Max, being a real dog, does not have much to say, so his line is quite short. We recommend visiting the Grinch in the morning shortly after he arrives for the shortest line. And if you send the Grinch a postcard promising three good deeds, donations will be made to help support tutoring for homeless youth! The Grinch cannot stand to miss a tree lighting or the chance to steal a show, so he makes appearances in Martha May and the Who-Dolls show and the tree lighting show, which now tells a little more of the Grinch story. Both shows were revamped for 2018, so we can't wait to see what 2019 brings! What we do know is that Christmas at Universal Studios Hollywood 2019 will be the most Grinchful time of the year at the park. You can’t miss him! There is so much to celebrate during the Wholidays. You can meet the Grinch or Max, meet Who citizens and enjoy musical entertainment from the beatbox-style Wholiday singers or Martha May and the Who-Dolls. Shows cycle throughout the day and late afternoon. Starting at 5:30 p.m., all the Whos (along with the Grinch) gather on stage for the Christmas tree lighting, which occurs every 30 minutes, followed by snowfall. 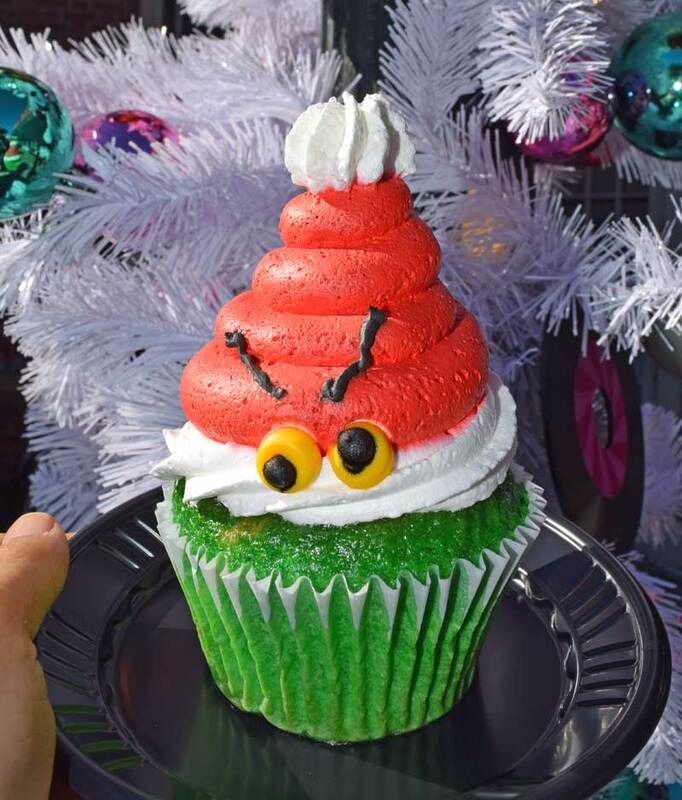 In terms of other treats, there are some mini doughnuts and Grinchy cotton candy to buy, as well as other holiday favorites you can find in Grinchmas and at the surrounding restaurants. 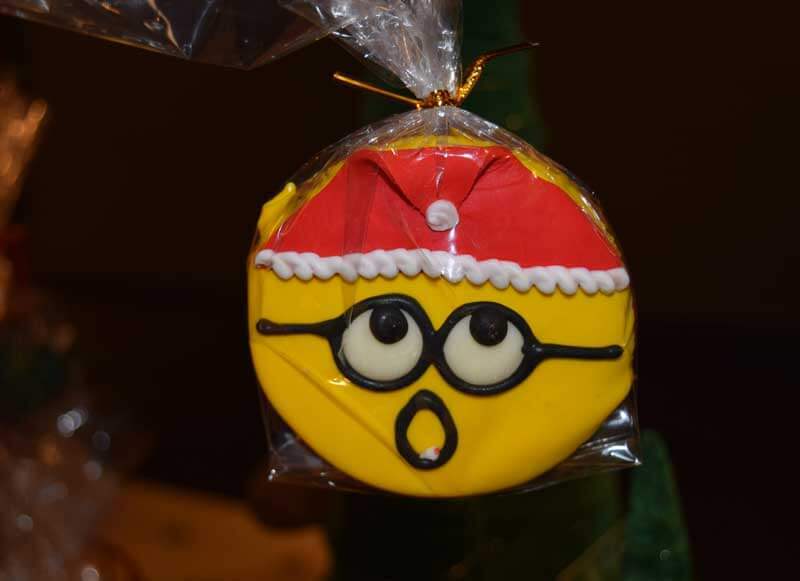 There are Wholiday cookies (we were happy to see the addition of a Hanukkah cookie last year), giant Grinchy doughnuts, Grinch cupcakes, hot chocolate cupcakes, flavored hot chocolate drinks (great for warming up when it gets dark) and chocolate peppermint rice crispy treats. The restaurants also sell cans of Who Hash, which are tater tots with beef, gravy and green onions. You can even find eggnog shakes at some locations. 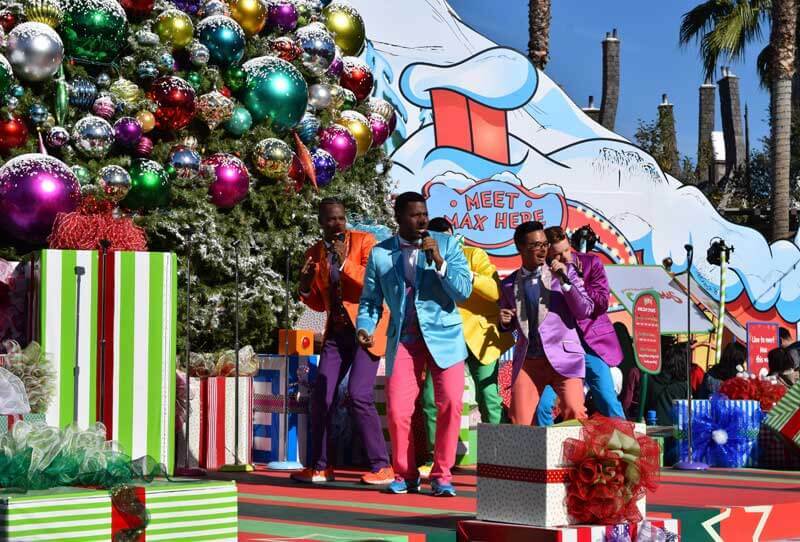 When can you experience Grinchmas during Christmas at Universal Studios Hollywood 2019? Grinchmas falls only on select days of December. The 2019 dates have not been released yet, but in December 2018, Grinchmas fell the first two weekends of December and daily the last two weeks of December. The Frog Family likes to hop in and out of the Grinchmas Who-bilation in the Upper Lot throughout the day because something new is always happening there. Different Who characters make appearances throughout the day. There are signs with all the Wholiday event times posted at Grinchmas entrances so you can plan accordingly. There are lighter crowds during the day than at night. Most musical acts run throughout the day and late afternoon. 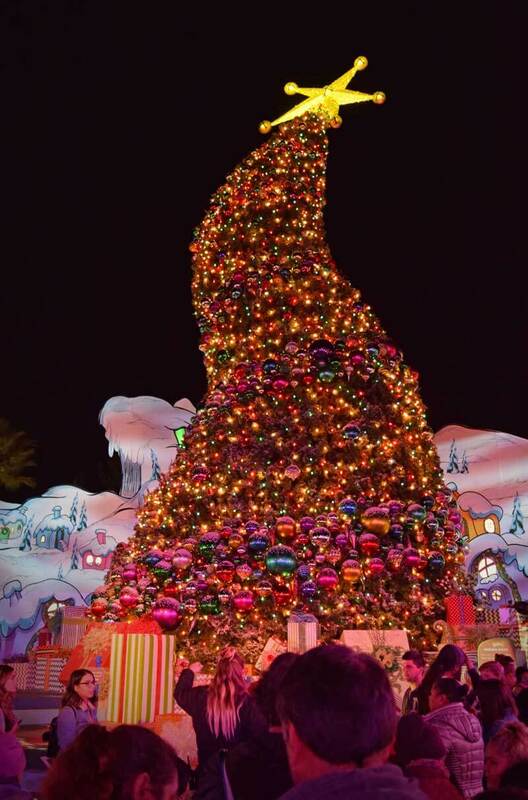 The Christmas tree lighting is fun, so be sure to visit Grinchmas at Universal Studios Hollywood during the night too, starting at 5:30 p.m. The lights after dark make the whole scene even more festive. Note that there is no longer a musical act with the Grinch during the Studio Tour, nor is there storytime with Cindy Lou, but they wrapped some of the Grinch’s story into the tree lighting, which was pretty cool. You’ll find Grinchmas in the Upper Lot in Universal Plaza. It is just a hop, skip and a jump away from both The Wizarding World, Minion Mayhem (where you can meet Minions and other Despicable Me characters) and Super Silly Fun Land. 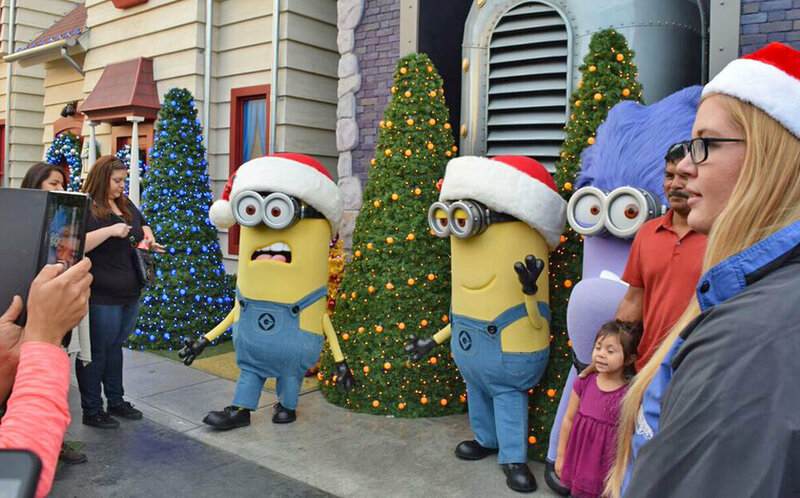 This makes Grinchmas one of the most fun times of year at Universal Studios for young tadpoles! 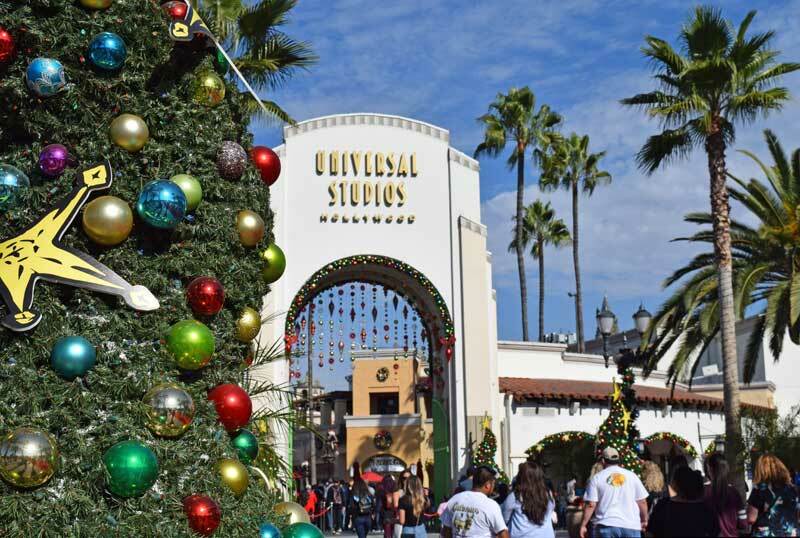 Why go to Christmas at Universal Studios Hollywood in 2019? It’s toadally fun, of course. Where else will you see a Seuss-ian wonky Christmas tree that changes colors at night and real live Whos? The Grinch is hilarious now that he is not trying to ruin your holiday (and he’s green, right? Can I get a ribbit ribbit for my favorite color?!). 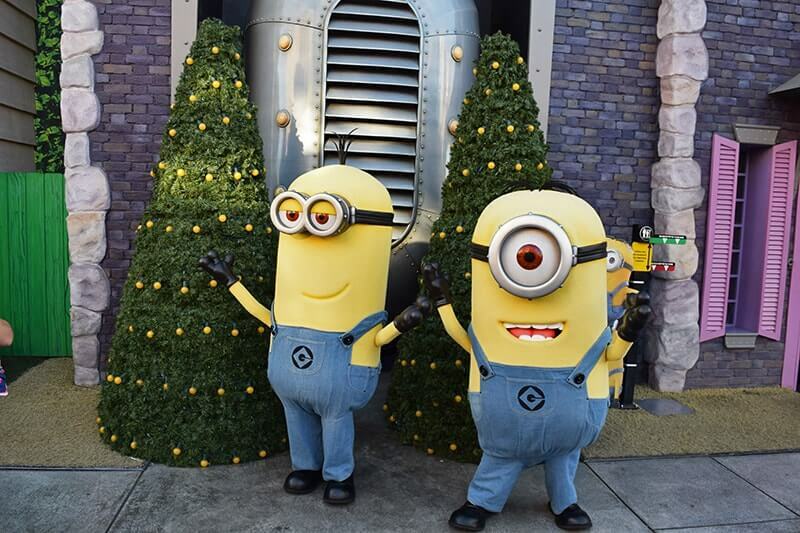 It is something new to try at Universal and provides holiday fun for the whole family. Where else do you get to see snow and Christmas trees next to palm trees? Snowfall in Southern California is already pretty magical, but snowfall in Whoville or a wizarding village is even more amazing. After visiting Grinchmas, hop on over to The Wizarding World for a cup of hot Butterbeer or a holiday dinner. Yum! Click here for more on Wizarding World eats and drinks. 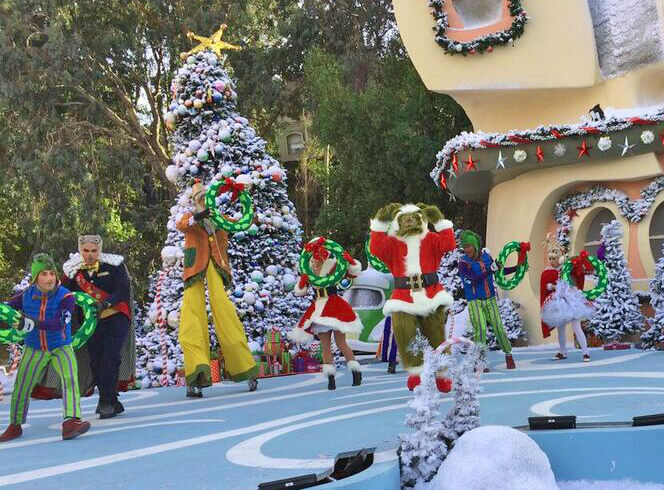 How should you approach Grinchmas at Universal Studios Hollywood? Hit the Grinch line as early as you can, and then hit the Studio Tour or your must-see rides. Return to the Grinchmas area in between other attractions when ride lines are long and meet some Whos. Then, come back to see the tree lighting and snowfall, and watch some other musical shows. Note that the Grinch leaves his post meeting guests to do the Tree Lighting Show every half an hour as of 5:00 p.m., and his role is more significant this year, so the Grinch line moves a little slower at night. Know the park hours before you arrive. Plan to stay until the park closes. Consult the app for show times so you can catch all the shows you want to see, and be sure to check the Grinchmas signs for all the programming and event times. Ask the employees in the Wizarding World about show times and snowfall. Bring a sweatshirt — even if it is warm and sunny during the day, it can cool off significantly at night. If there are multiple Hogwarts Castle shows, see a later one for lighter crowds, or hop in place an hour before the first show to catch a bonus early show. Meet Santa Claus in Universal City Walk. Check out the Hanukkah décor in the window of Saul & Sons New York Deli and Market façade in Upper Lot. Try holiday treats, but save room for the English Holiday Dinner and hot Butterbeer in The Wizarding World. Purchase a Front of Line pass so you can fit everything in. Take advantage of Single Rider lines and Child Switch service. 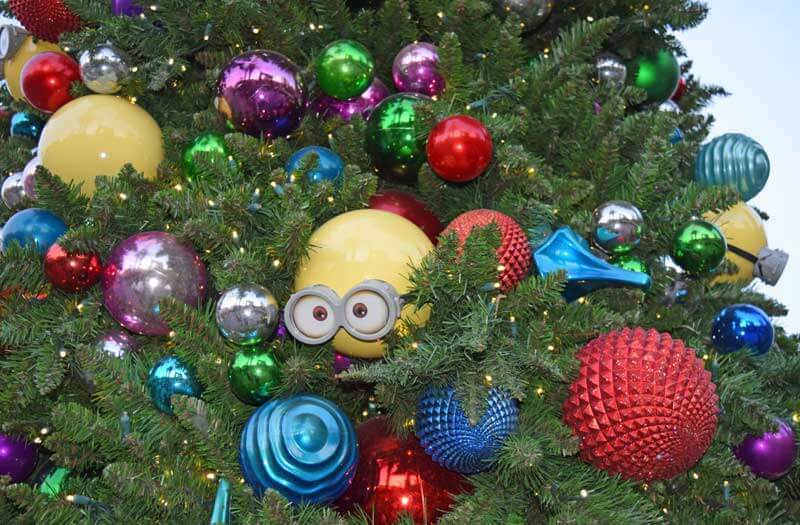 Enjoy the Minion Christmas Tree in the Lower Lot (as well as the many trees near Despicable Me: Minion Mayhem). Consult ushwaittimes.com to locate Dreamworks characters, Scooby Doo and friends, Simpsons characters, Frankentein’s monsters, the Mummy, Sponge Bob and Patrick, Curious George, Hello Kitty and more. Ring in the New Year with Universal Studios Hollywood’s EVE event Dec. 31. Enjoy multiple party areas with music, dancing, food, souvenirs and a midnight countdown celebration with fireworks! Even though the earlier dates of Grinchmas are not as crowded as peak times near holidays, the park hours are much shorter in early December, as in 9 a.m. or 10 a.m. to 7 p.m. the first few weekends compared to 8 a.m. to 10 p.m. during the peak season. Having Front of Line any of those days can help you experience more of the park, from the seasonal entertainment to all the rides and shows, no matter which day you visit. 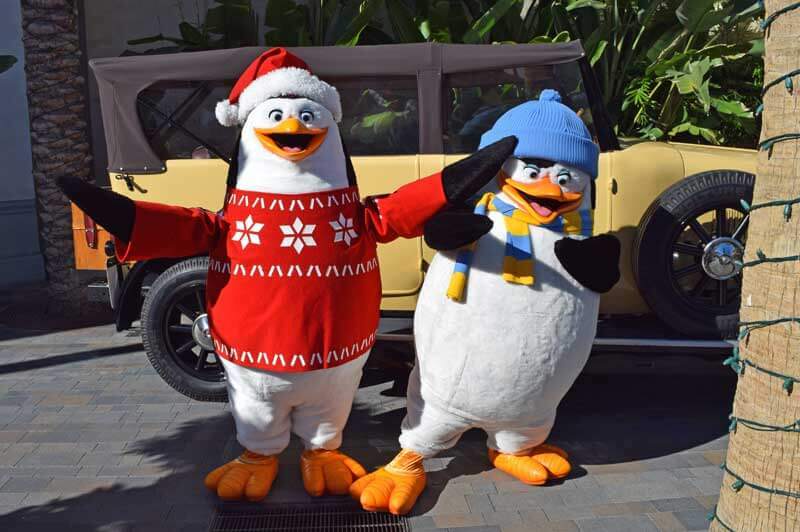 What are you most looking forward to during Christmas at Universal Studios Hollywood 2019? Share a tip or two in the comments below. 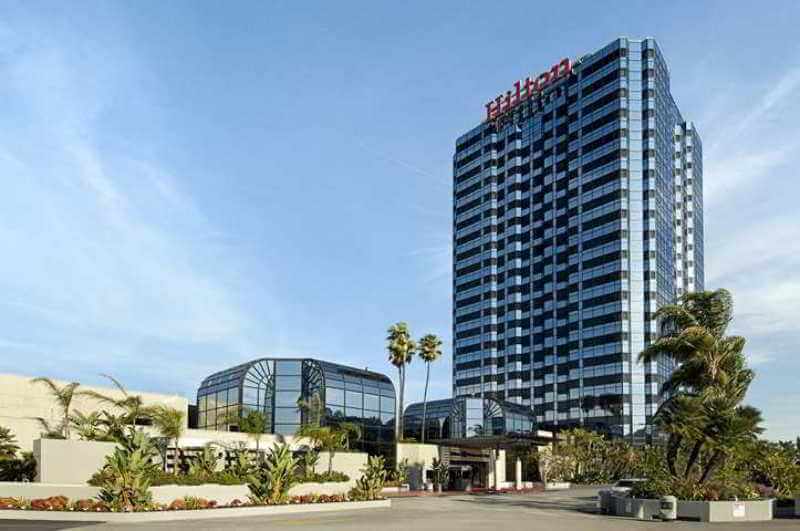 If you are looking for a hoppin’ deal on lodging in the Los Angeles area, Undercover Tourist offers discount hotel rooms near Universal Studios. Beat the traffic and save time by staying nearby. Merry Grinchmas and Hoppy Wholidays! Does the Grinchmas happen every year? And if so, when will it start in 2019? Planning a trip and want to go to it. Grinchmas is so much fun! It's an annual tradition for our frog squad! While it happens every year, keep in mind that it and all events, until confirmed, are always subject to change. Hi there! I was wondering if you had any idea about the photo times for grinchmas? Tried to get one last year but missed the window! The Grinch does photos all day long, usually from about 10 a.mm until near closing time. The line is about an hour all day, up to 90 min. in early December, or longer closer to the holidays. The Whos wander about all day for photos. Hope this helps! 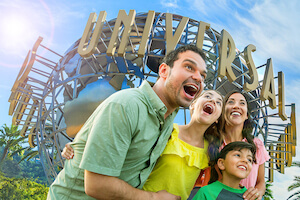 We are going to both universal studios and isles of adventure on Dec. 18, 19, and 20.....tues through Thurs. Is it really busy during this time? Also would you suggest getting the express pass? You can check out our Crowd Calendar for details, but this looks like a pretty great time to visit! Since you have three days to enjoy, we don't think Express Pass is a necessity. Are you open on Christmas for Grinchmas? does Fast of line ticket work for the grinch show as well? I like to know when the grinch program starts/how often and fron what time to what time? It's about 25 minutes. Show times vary. You can find times on Universal's site. When can we purchase tickets for grinchmas? Grinchmas is included with regular theme park admission. You can purchase a ticket now! Do they always do it on Saturday and sunday?!?!? we are going Dec. 8th(Friday) also if we go on the Friday not the date of it , is there still Grinch and whoville things to see? Grinchmas dates are usually Saturday and Sunday in early December and then every day once the holiday break gets underway. They do not usually release the dates until mid to late November. We will be there Dec. 3rd. It's the first Sunday of the month. Do you think they'll be having Grinchmas then? We were planning on the 6th but from the looks of 2016's schedule they did it the first two weekends only, then daily from the 16th on. I'm hoping we get to see it!! I'll be so sad if I buy my tickets now for the 3rd and they don't do it until after our trip. While it's always possible they could start early, we would expect Grinchmas to follow the same schedule as last year. Great article...do you have any specifics as to the times of the shows or when the Grinch begins his meet & greets? Universal Studios Hollywood does not publish showtimes online. Grab a show time schedule when you arrive at the main gate during your visit. Please let me know when Grinchmas 2016/2017 dates are. I would like to send my Grandson there for Christmas. Looks like the best time ever !!! !